When Sonya Sones published the ever-popular, What My Mother Doesn’t Know, I read it and thought to my 16-year-old self, Dang, these are going to get POPULAR. And by these, I mean, of course, novels in verse. Different from a collection of poetry, novels-in-verse are usually told from the POV of a character, tend to be more linear, and focus slightly more on content rather than form. In my extremely amateur opinion, of course. 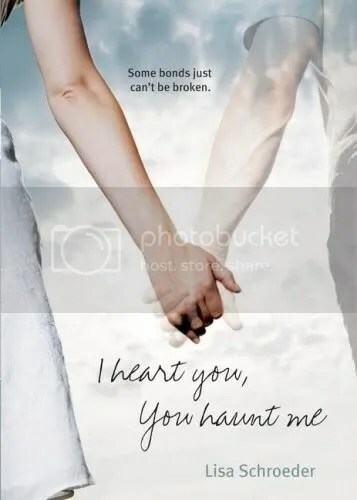 I Heart You, You Haunt Me is a delectable combination of light fantasy and poetry. The story begins with a tragedy. The boy Ava thought she’d be with forever, Jackson, is dead. An accident. Ava is heartbroken and confused and sad. So when Jackson starts coming to her room when no one else is around, talking to her and comforting her, she doesn’t know if she’s haunted, lucky, or just a little crazy. Ava works through her emotions over the loss of her boyfriend while struggling with what to do about the boyfriend she still appears to have. This is a unique read, and one you’ll have trouble putting down. Buy this for: 13-15 year-old romantics, girls who might just be a *little* too young for Twilight but still want to ache along with someone like them, or your cousin who keeps telling you that ghosts are haunting her attic. Bonus points for paring it with the brand-spanking-new Far From You.